What better way to celebrate summer than with a luau? Just mix some fruity beverages, invite your friends, and exchange a lei or two. And what better way to inject some island fun into your ho`olaule`a (celebration) than with these fonts? All are he makana nau (a gift to you) from the font designers, so enjoy. Relaxed and easygoing, the Shifty Chica font by designer Ray Larabie is perfect for invitations, posters, and other display uses. Regardless of Shifty Chica's nefarious-sounding name, this TrueType font's deep descenders with curly serifs make me want to dig out my 1950s one-piece and stir up some Cherry Cola Salad. You get both uppercase and lowercase letters with Shifty Chica, plus numbers and all the characters found on a regular keyboard. The apostrophe is straight, so it can double as an `okina (one of two diacritical marks in the Hawaiian language, the `okina resembles an upside-down apostrophe). Although the letters' bulk can make them bunch up a little on occasion, Larabie shows his skill as a typographer with generally excellent spacing--it's so good, in fact, that you could use this font in sizes down to 12-point without making the result impossible to read. That said, if you're a perfectionist, you may want to tweak the kerning of certain letter combinations if you plan to use Shifty Chica as a display font. Shifty Chica is free for personal use, and has a suggested donation of $40 for commercial use. As relaxed as handwriting without being informal, Hecubus from Lauren Ashpole features inward-curving downstrokes that bend like palm trees swaying in a light sea breeze. Ashpole has achieved the perfect balance between taking it easy and getting it done with this highly legible TrueType font. Hecubus includes a full character set that encompasses numbers and a smart makeshift `okina (use the grave accent key). Plus, although the character style is the same, the cap height is slightly greater than the x-height, allowing you to capitalize subtly. You can easily use Hecubus for subheads without losing any definition, but it may become difficult to read at any size smaller than 10-point, purely as a result of being all-caps. The font is free for personal use; for commercial use, contact the designer. 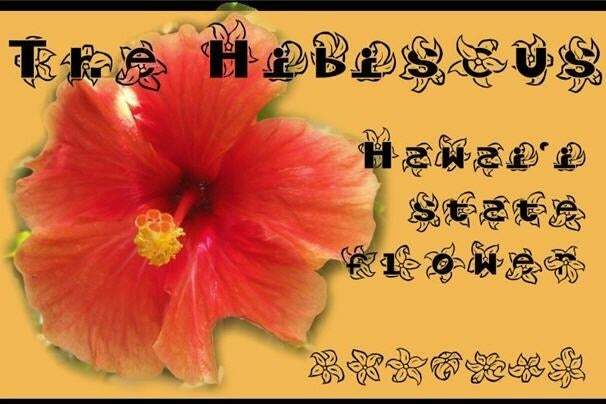 The fanciful Hawaiiah uses the hibiscus--the state flower of Hawaii--to create its tropical-island appeal. Outlines of seven different flowers curl and hide behind bold uppercase and lowercase letters. Hawaiiah, a TrueType font by designer Jesse Wilson (aka Caffeen), also includes numbers, hibiscus flowers as dingbats, and basic punctuation (apostrophe, colon, and semicolon sans flower; question mark and exclamation point with a hibiscus). A poster or display font to use sparingly, Hawaiiah merges the easy elegance of the beautiful hibiscus shape with characters of varying line weight. Combined with nonexistent ascenders, this design makes Hawaiiah more fun than functional. All around, however, Hawaiiah is like a barefoot walk on a beach: Sometimes it's just what you need. Hawaiiah is free for both personal and commercial use. A luau isn't complete without tiki. The TrueType, all-caps Tiki Tooka from Blue Vinyl Fonts includes numbers and a few characters (an exclamation point, a caret, a plus sign, a colon, a semicolon, and a few others) plus both a straight apostrophe and a regular curved version. Considering Tiki Tooka's detailed inner white space, I wouldn't use the font at any size smaller than 24-point, and since it has no lowercase letters, it really isn't for anything other than headlines. Nevertheless, the nice block heft of this font melds well with the tiki symbolism, and the straight lines with tiny flares on the ends are reminiscent of a woodcut. Tiki Tooka is free for personal use; for commercial use, contact the designer, Jess Latham. While this is currently a TrueType font, Latham is in the process of converting it to OpenType, and he expects to release that version by the end of the year. If you need graphical elements, Tropicana--a TrueType dingbats font also from Blue Vinyl--may awaken your inner beachcomber. Tropicana comprises 26 different depictions, including shells, fish, tiki, hibiscus blooms, palm trees, a parrot, and umbrella drinks. All are drawn in stylish, smooth lines, with impeccable attention to detail. Some of the icons are classy enough to use in an invitation for a beach wedding or another non-flip-flop event. For most of the characters, 18-point is the minimum size for clarity. However, unlike most dingbats fonts, Tropicana holds up well to being significantly oversized: This collection is a step above your normal pictorial icons. 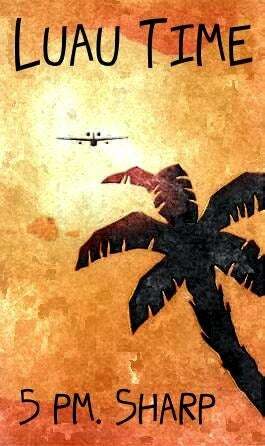 Tropicana is free for personal use; for commercial use, contact the designer, Jess Latham. As with Tiki Tooka, Latham is currently in the process of converting Tropicana to OpenType. Tricky Hawaiian diacritical marks aside, if you're looking for a free font with a relaxed, Hawaiian-vacation feel, these five are hard to beat. Aloha.